The warm weather is finally here in Nova Scotia! My sandals now have made their home in my closet and summer t-shirts, dresses, skirts and shorts have found their way to the front of my closet. My feet were in desperate in need of a pedicure and a splash of colour. I recently had the chance to try out OPI’s new neon nail lacquer collection, Neons by OPI, and it was exactly what my feet needed to get ready for sandal weather. Neons by OPI are the brand’s first full-size neon shades and what’s even cooler than that is that they are now part of their permanent collection. Get your fingers and toes all prepped for summer fun with these fun, flashy shades. Also with the collection is a special white base coat called Put a Coat On! which is designed to boost the neon colour. Put a coat on before you apply your colour to make your nails really pop. I grew up in the 80’s and remember wearing many neon outfits. I had a slew of neon Hypercolor t-shirts and a neon pink jacket that made your eyes hurt if you looked at it too long. Fun times. It’s neat to see these colours coming back into fashion. I’m not sure I’d ever wear a jacket like that again, but I love wearing these colours on my fingers and toes! Life Gave Me Lemons: This citrusy lemon-lime hits the spot every time! You are So Outta Lime! : Here comes trouble ands he’s wearing this outspoken lime green! Juice Bar Hopping: This tangerine cream makes me jump for joy! Hotter than You Pink: Just when you think pink can’t get any hotter, there’s this! Push & Pur-Pull: This forceful purple has got me coming and going! Down to the Core-al: The beauty of this brilliant coral goes beyond skin deep. Put a Coat On! : Amp up any bright shade with this color-boosting base coat. Though I think all the shades are pretty and I plan to wear them all as the summer rolls in, my favourite is the the lime green, You are So Outta Lime! I have it on my fingernails in the picture below, but I also have it on my toes. It stands out in contrast to my black sandals. I’ll spare you the picture of my feet though! 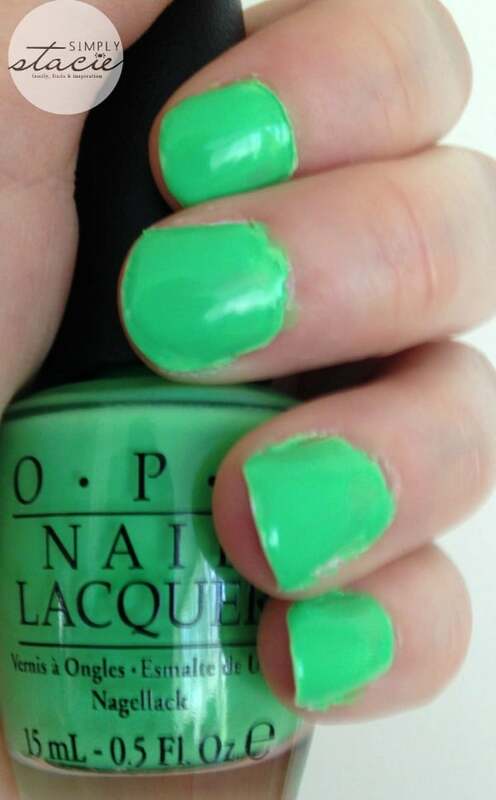 In addition, OPI has also launched its first neon gel shades. Neons by OPI will also be available in GelColor, but is only accessible at professional salons. It’s a service that provides a high-shine, 100% gel finish that lasts for weeks with a 30 second LED cure. If you are heading on a summer vacation and don’t want to worry about your nails while you are away, then this may be a good option for you to keep nails chip-free and flawless. 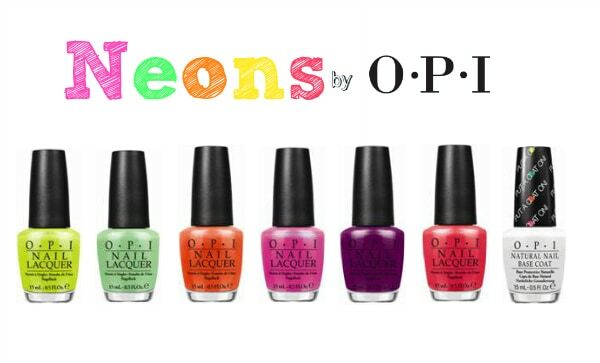 Neons by OPI are now available in both nail lacquer and GelColor (for professionals only). The nail lacquers retail for $10.95 and can be purchased at professional salons and spas across Canada. Which neon shade will you be sporting this summer? Love the names of all the colors, especially Push & Pur-Pull!!! I don’t wear nail polish, but these would definitely make a great gift for my siblings. I love these shades! I can’t even pick a favourite! These are such great colours! Def need to get some thanks! I LOVE down to the core-al!!! That would be my go-to summer shade! I really like the two green shades for pedi’s this summer. I think they would look great with neutral sandals! I love using bright colors for Summer, and the lime and pink look right up my alley, i cant wait to try them. Lime is awesome! Wonderful for summer! I love the summer colors! So pretty! Thank you for the great review! COOL COLORS ESPECIALLY THE PURPLE! Now I want to try the Juice Bar Hopping! Great color! I love these colours! So fun and pretty. I think my summer toes will need these. My daughter has some of this nail polish. I think I’ll give it a try. I love these shades….they are all my favourites !